If you do not already own a Brittany and are interested in acquiring one, PLEASE do your homework first! Although they are adorable and loveable, Brittanys are definitely not for everyone. First, you must realize that the Brittany is bred to run, hunt, and find birds. As a sporting breed, it is very active and needs daily exercise. 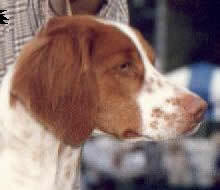 A highly intelligent dog, the Brittany needs a regular outlet for its intelligence and its high level of energy. As a rule, the Brit will not be happy lying on the floor all day and it would most likely rather take you for a walk than the other way around. Above all, it would rather pursue birds than almost anything else. We've all heard of people who have had Brittanys that were calm, laid back, easy-going couch potatoes but these are the exceptions -- not the rule! They ARE affectionate; they ARE usually good with kids and, of course, they are terrific to look at. Just remember that the chances are good you will acquire one that needs a lot of exercise, so ask yourself whether you are willing to make that commitment. Male or Female? There is a popular belief that female Brittanys are better pets/hunters than males. Although this may be the case with some breeds,it is not necessarily so with Brits. There are female Brittanys that are difficult to train, hard to get along with, and who can't hunt a lick -- in about the same proportion as males. The boys are generally just as loving and sweet as females and both sexes generally make excellent hunters. Males are NOT more difficult to housebreak and marking will almost never be an issue if the dog is truly housebroken. The point is that there are fabulous Brittanys and less than fabulous Brittanys of both sexes. Temperament differences vary among individual dogs, not between the sexes. If you are committed to owning a Brittany, please feel free to contact the San Diego Brittany Club for information on litters that may be available at any given time. And, oh yes... never buy a puppy from a pet store, at an auction, from a box in front of the supermarket, etc. Get a referral to a reputable breeder. Just send an e-mail to mrybrown@gmail.com for referrals to Brittany breeders. Perhaps a puppy is not right for you. If you'd like to get past all the puppy chewing, housebreaking, and running around like a Tasmanian Devil stages, an adult might be just right for you. You can visit the American Brittany Rescue web site at http://www.americanbrittanyrescue.org for more information. Above all, if you have a Brittany or have decided to get one, we'd love to have you participate in our club. Please click on the "Membership" link to find out how to join.